Rationing and recycling will be an essential part of life on the International Space Station. In this article, Science@NASA explores where the crew will get their water and how they will (re)use it. November 2, 2000 -- Future astronauts poised to blast off for an extended stay on the International Space Station (ISS) might first consider dashing to the restroom for a quick splash at the lavatory, or better yet, a luxurious hot shower. Once on board the ISS, spacefarers are in for a steady diet of sponge baths using water distilled from -- among other places -- their crewmates breath! If you're squeamish, read no farther, because the crew will eventually include lab rodents -- and they'll be breathing, too. All of the denizens of the space station lose water when they exhale or sweat. Such vapors add to the ambient cabin humidity, which is eventually condensed and returned to the general water supply. Sometimes it's better not to think about where your next glass of water is coming from! Rationing and recycling will be an essential part of daily life on the ISS. In orbit, where Earth's natural life support system is missing, the Space Station itself has to provide abundant power, clean water, and breathable air at the right temperature and humidity -- 24 hours a day, 7 days a week, indefinitely. Nothing can go to waste. 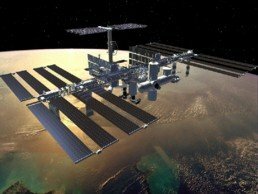 In this article, the first of a series about the practical challenges of living in space, Science@NASA will examine how the Space Station's Environmental Control and Life Support System (ECLSS), under continuing development at the Marshall Space Flight Center, will help astronauts use and re-use their precious supplies of water. Future installments will explore air management, thermal control and fire suppression -- in short, all of the things that will make the Space Station comfortable and safe. Before recycling can begin, there has to be some water to start with. "We have plenty of water on the Space Station now," says Jim Reuter, leader of the ECLSS group at the Marshall Space Flight Center. "The Russian module Zarya is packed with contingency water containers (CWCs) that were carried over from the Space Shuttle during assembly missions earlier this year. They look like duffle bags and each one holds about 90 lbs." "But it's expensive to ferry water from Earth," he added. "We have to recycle. There's already a Russian-built water processor in orbit that collects humidity from the air. Here at Marshall we're building a regenerative system that will be able to recycle almost every drop of water on the station and support a crew of seven with minimal resupplies." 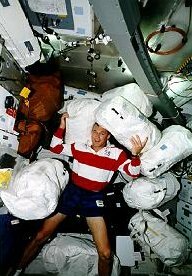 Right: Shuttle pilot Terry Wilcutt with 7 contingency water containers destined for the space station Mir. The ECLSS Water Recycling System (WRS), developed at the MSFC, will reclaim waste waters from the Space Shuttle's fuel cells, from urine, from oral hygiene and hand washing, and by condensing humidity from the air. Without such careful recycling 40,000 pounds per year of water from Earth would be required to resupply a minimum of four crewmembers for the life of the station. Not even research animals are excused from the program. "Lab animals on the ISS breath and urinate, too, and we plan to reclaim their waste products along with the crew's. A full complement of 72 rats would equal about one human in terms of water reclamation," says Layne Carter, a water-processing specialist at the MSFC. It might sound disgusting, but water leaving the space station's purification machines will be cleaner than what most of us drink on Earth. "The water that we generate is much cleaner than anything you'll ever get out of any tap in the United States," says Carter. "We certainly do a much more aggressive treatment process (than municipal waste water treatment plants). We have practically ultra-pure water by the time our water's finished." On Earth, water that passes through animals' bodies is made fresh again by natural processes. Microbes in the soil break down urea and convert it to a form that plants can absorb and use to build new plant tissue. The granular soil also acts as a physical filter. Bits of clay cling to nutrients in urine electrostatically, purifying the water and providing nutrients for plants. Water excreted by animals also evaporates into the atmosphere and rains back down to the Earth as fresh water -- a natural form of distillation. Above: When water evaporates from the ocean and surface waters, it leaves behind impurities. In the absence of air pollution, nearly pure water falls back to the ground as precipitation. Water purification machines on the ISS partly mimic these processes, but they do not rely on microbes or any other living things. "While you try to mimic what's happening on Earth -- which is so complicated if you really think about it -- we have to use systems that we can control 100 percent," said Monsi Roman, chief microbiologist for the ECLSS project at MSFC. ECLSS depends on machines -- not microbes -- because, "if a machine breaks, you can fix it." The water purification machines on the ISS will cleanse wastewater in a three-step process. The first step is a filter that removes particles and debris. Then the water passes through the "multi-filtration beds," which contain substances that remove organic and inorganic impurities. And finally, the "catalytic oxidation reactor" removes volatile organic compounds and kills bacteria and viruses. Once the water is purified, astronauts will do everything possible to use it efficiently. "On the ground, people flick on the faucet and they probably waste a couple of liters of water just because it's free and the water pressure is high," notes Carter. "On the ISS, the water pressure will be about half what you might experience in a typical household," Carter said. "We don't use faucets on the ISS, we use a wash cloth. It's much more efficient. If you're an astronaut, you'll wet the wash cloth with a spray nozzle and then use the cloth to wash your hands." On the space station, people will wash their hands with less than one-tenth the water that people typically use on Earth. Instead of consuming 50 liters to take a shower, which is typical on Earth, denizens of the ISS will use less than 4 liters to bathe. Even with intense conservation and recycling efforts, the Space Station will gradually lose water because of inefficiencies in the life support system. "We will always need resupply, because none of the water reprocessing technology that is available right now for space flight ... is 100 percent efficient. So there's always some minimal loss," said Marybeth Edeen, deputy assistant manager of environmental control and life support at NASA's Johnson Space Center. Water is lost by the Space Station in several ways: the water recycling systems produce a small amount of unusable brine; the oxygen-generating system consumes water; air that's lost in the air locks takes humidity with it; and the CO2 removal systems leach some water out of the air, to name a few. Above: One of the "nodes" that will become a part of the Space Station. The ECLSS life support equipment will be housed in Node 3, which is scheduled to be attached to the station in October 2005. Lost water will be replaced by carrying it over from the Shuttle or from the Russian Progress rocket. The Shuttle produces water as its fuel cells combine hydrogen and oxygen to create electricity, and the Progress rocket can be outfitted to carry large containers of water. NASA scientists will continue to look for ways to improve the life support systems of the Space Station, reducing water losses and finding ways to reuse other waste products. If the water recycling systems can be improved to an efficiency of greater than about 95 percent, then the water contained in the Station's food supply would be enough to replace the lost water, Edeen said. "It takes processes that are slightly more efficient than we have developed for the space station to do that," Edeen said. "Those are the next generation water processing systems. Those are being developed now, but they're not ready for space flight yet." 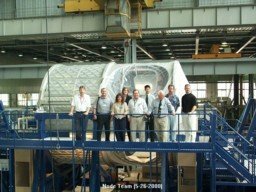 The ECLSS life support system will join the Space Station as part of Node 3, which is scheduled to launch in October 2005. Until then, the environment inside the ISS will be maintained primarily by life support systems on the Russian Zvezda Service Module.